It’s a warm sunny Monday in California as I sit in my local cafe and sip my cup of tea. Today, I share my personal journey of pain, suffering and loss and how I have come to experience a joyful and fulfilled life. I, Patricia Ann Farrell, a disciple of His Holiness Dorje Chang Buddha III, today will share out of great compassion for all living beings, a personal story of how I transformed my pain from a loss of the dearest love in my life. In June 2014, I received the news my love, Buddhist brother, musical performing partner, and best friend left this world. I was at my Buddhist temple, Hua Zang Si in San Francisco, CA. As I was speaking to one of the monastics (nun), I received a call that my love had passed away. It was very fortunate to be at my temple when the call came! I could not even speak. I handed the phone to the monastic and went to the Sakyamuni Buddha Hall in the temple. As I cried in shock and pain, I bowed to the visage of H.H. Dorje Chang Buddha III and the solemn 22-foot statue of Sakyamuni Buddha (Disciple of a manifestation of Dorje Chang Buddha) The place I was certain to receive help was from the Buddhas and Bodhisattvas in this time of deep pain and suffering! I was overwhelmed with this notion of such a loss. My pain was like a sharp knife in my heart! I have been learning the true Buddha-dharma of H.H. Dorje Chang Buddha III for fifteen years and have received limitless blessings over the years which has helped me to transform my heart-wrenching pain into joy and happiness today! On this day in June 2014, I was told by the monastic, “Patricia, do not worry about your future!” The faith in my heart deep as all the oceans knew this: my pain could not allow me to see through the thick fog of my mind! I knew my journey as a Buddhist disciple of H.H. Dorje Chang Buddha III was going to assist others to liberation and that working through my pain and turmoil was preparing me to do so. Today, I am very clear and certain of this fact! “How can I not worry about my future,” I asked myself. I was on unemployment at the time of his passing with only two months left till I had no money! I would also have to move from our beautiful home and find a new place to live, but how? No money, no job, no home and my dear love gone, all at once!!! My faith, cultivation level and how I would choose to apply my learning from the true Buddha dharma of my Buddha Master, H.H. 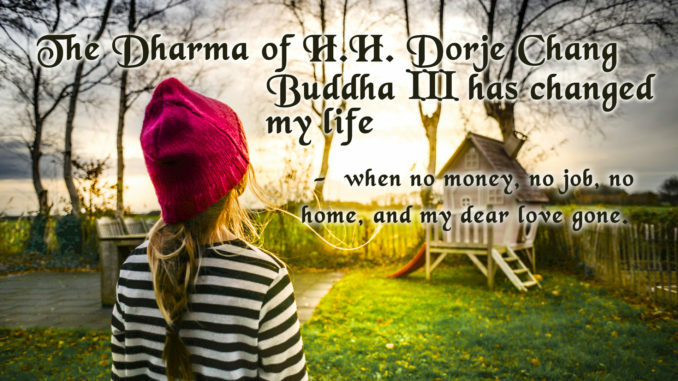 Dorje Chang Buddha III, would be put to a test. I knew my greatest work as a Buddhist disciple to benefit living beings was about to begin! I received a call from my brother in Florida, he said: “Sister, come down here and live with us, be here with family!” Sure….I could live in a very big beautiful home, no stress, comfortable and safe. That sounded really sweet. I even considered it for a few days! I asked myself, “how can I possibly go towards safe and comfort when there are so many living beings suffering like myself?” I had the “key” to unlock all of the suffering of the world. It would be selfish for me to throw away this key for even “ONE DAY!” I am so fortunate to be a human in this world and have even greater fortune to encounter the true holy Buddha-dharma of H.H. Dorje Chang Buddha III. “NO!”, I shouted in my head, ”this is my own karma and I need to clean it up so I may help others.” This was my vow and deep motivation to keep moving forward with a heart of compassion for my own suffering, so that I may deepen my compassion for others! My cultivation, learning the Buddha-dharma from my Buddha Master, volunteering at my temple Hua Zang Si and assisting my community together, brought me the good fortune of receiving financial assistance from my Buddhist brothers and sisters at my temple as well as a place to live, food and an abundance of loving support from the sangha at my Temple and my Buddhist family! Within three months, I had a wonderful job and my own apartment in a beautiful small community in the east bay! Today, almost three years later, my financial fortune has increased, my job is wonderful and fulfilling, my community is growing and abundant, my health is good, and my pain has transformed to brightness and joy in my heart! Life will always have its difficulties and challenges, I do experience them. However, I have great joy in my heart knowing I have that “key” – the key of learning the true holy Buddha-dharma of Sakyamuni Buddha and my Buddha Master, H.H. Dorje Chang Buddha III. This is the very true reason I was able to be with my pain and deep suffering while continuing my Buddhist studies, volunteering at my temple and assisting others while re-building my whole life from scratch! I concluded knowing deep in my heart that others’ suffering is my own suffering. I am just fortunate to have found the key to unlock the suffering of my own karma! May all the merits from sharing my personal story benefit all living beings whom are my family to have a happy and prosperous life with good health and an abundance of good fortune! What a beautiful story ! It’s so inspirational and full of positive energy and compassion. So sincere and moving! Thank you for sharing this with us.